Dr. Raghavan. R.S., Electrical Eng. Dept, Northeastern Univ. Theory and practice of modern signal processing techniques. Characteristics of discrete signals and systems; sampling and A/D conversion; diﬀerence equations; convolution; the Z-transform, the Fourier transform and the discrete Fourier transform; fast Fourier transform algorithms; digital ﬁlter realizations; design techniques for IIR and FIR digital ﬁlters; computer programs for ﬁlter design; quantization eﬀects in DSP. 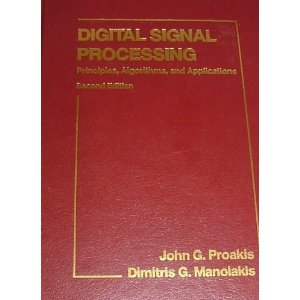 Digital Signal Processing by Proakis, Macmillan and Manolakis.